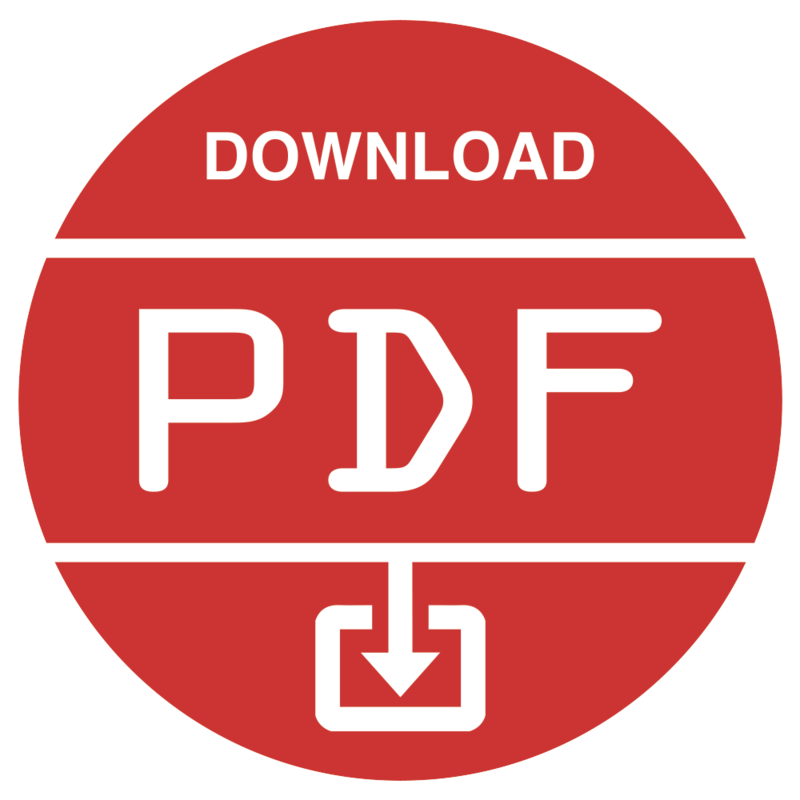 This study of Cambodian online newspapers – The Phnom Penh Post and The Cambodia Daily ­– employs a content analysis to determine the coverage level, and content characteristics of development news in Cambodia as a developing country. Previous research studies suggest that news organizations in developing countries tend to devote higher attention and allocate a large proportion of space for development news. Additionally, newspapers in developing countries, past studies indicate, cover development news mainly with references to influential government officials or prominent political figures because these individuals wish to be seen as “champions of development issues”. The findings suggest that the two papers do cover more development news than non-development ones at the ratio of 58 percent to 42 percent. Regarding appearance of government officials or political leaders in development news articles, the results disagree with past studies, suggesting that private sectors dominantly appears in development news. The reason is Cambodia adopts a market-based economy where privatization is applied to almost all development issues. Moreover, Cambodian government does not have any control over the privately owned, independent newspapers, particularly The Phnom Penh Post and The Cambodia Daily. People’s adaptation to changes in the field of social, economic and technological spheres are crucial for their quest to lead a successful and high-quality life. Not only do people need to feel free to talk about the process of development but also sincerely become a part of the development process. For countries, especially developing ones, that strive to achieve prosperity for their people, it is important that information and knowledge about such changes is made available to them on priority basis. The media has a major role in making sure that the people are well informed about, and thus properly involved in, the process of development. Previous researches suggest that news organizations in developing countries tend to devote higher attention and allocate a large proportion of space for development news. Additionally, newspapers in developing countries, past studies indicate, cover development news mainly with references to influential government officials or prominent political figures because these individuals wish to be seen as “champions of development issues”. This study of Cambodian online newspapers – The Phnom Penh Post and The Cambodia Daily ­– employs a content analysis to determine the coverage level, and content characteristics of development news in Cambodia as a developing country. “Development journalism gives soul to media; it gives it a human face,” said Downer, a development journalist with Panos Caribbean. It provides the public with a better understanding of the goals of development. Journalists have a role to create awareness and show people where the money is going, without ignoring the human aspect of these issues. Development journalism matters because development issues affect not only poor, but also rich countries. …development communication in some countries is confused with publicity for government projects. The government as the chief designer and administrator of a country’s development plans should rightfully tell people what is being done for them. But development communication is more than that. …the journalist …should critically evaluate and report the relevance of a development project; …the difference between the planned scheme and its actual implementation; and the difference between its impact on people as claimed by government officials and as it actually is. a widely participatory process of directed social change in a society, intended to bring about both social and material advancement (including greater equality, freedom, and other valued qualities) for the majority of people through their gaining greater control over their environment. In the Third World countries, development journalism is very attractive for fairly obvious reasons. This theory sees news media as an instrument of development, achieving both social justice and beneficial social change. In other words, the media should publish positive development tasks in line with nationally established policies. However, in reality this is not always the case. In poor countries, there has generally been pressure on journalists to associate themselves with the political forces, but in doing so they have lost their independence. A justification for government control over media is seen in the name of national security, religious and cultural harmony, and in the name of the systematic use of media to promote governmental agenda for development. McDaniel explains that political leaders in developing countries “wish to be seen as champions of development issues” and warns “it might undermine development as a responsibility of the whole population, picturing it instead as an activity of the influential and politically powerful”. On that count, a new government in a developing country may well wish to adopt the development model. It leaves control of the media in the hands of government if required and yet the media must still take responsibility. If the government decides that the media are not meeting its wishes or that they are challenging the state, it can intervene and apply whatever censure or control it deems necessary. Examples can be found in many developing countries, both in Africa and Asia. Zimbabwe displays a government seeking to use the press with some degree of compulsion to advance government policies, especially on economic and racial/ethnic issues. In Ghana, consolidation and perpetuation of political power are obtained in the name of development journalism. For instance, the first president Kwame Nkrumah used the media as a revolutionary tool of African liberation from colonialism and imperialism. In Asia, while there are frequent appearances of politicians on national televisions, development news content in India dominantly contain quotes from government officials. It is, therefore, obvious that developing countries appear to heavily adopt development journalism because there are numerous development issues and changes taking places. As Oladele and Anderson-Wilk explain, the dissemination of information on the media has been responding to changing scenes of social, economic, cultural, technological and political challenges in many countries, especially developing ones. Further, governments in those countries see opportunities to exercise their power via the practice of development journalism. In favor of these notions, past studies indicate that newspapers in developing countries tend to devote higher attention and allocate a large proportion of space development news, and quote government authorities or influential political leaders very often when covering development news. Another study presents an additional knowledge to the literature, saying privately owned or independent newspapers publish less development news with references to political figures than government-run ones do. The rationale behind this claim is apparently clear that independent media are normally free of the tendency to satisfy government demands because it is not funded by the government. Also with the phenomenon of democratization, market-based economy and privatization gradually becoming popular in many developing countries, independent institutions, including those in the media industry, begin to gain their independent voices free of government pressure and influence. Although, press freedom in some cases sounds promising in developing countries like Thailand, there is always undesirable reality. BBC publishes Thailand’s country profile, mentioning that the monarchy and the military remain threatening true freedom of private media, and that journalists usually exercise self-censorship when reporting anything related to them. This study aims to further explore the controversy around development news coverage of independent media in developing countries, using Cambodia as a country of focus. For all that, it is still worth noticing that this study only looks at the latest medium of newspaper publication which is the Internet as opposing to the majority of previous texts that heavily analyze print and broadcast journalism. Online journalism definitely has a unique nature different from that of print and broadcast such as print newspaper, radio and television. As the World Wide Web connected computers around the world in the early 1990s, digital content – that include text, audio, video and interactive forms – were tremendously shared, making abundant information available to all users of Internet-connected computers and ushering in the dawn of information age. Journalism organizations put efforts to distribute their editorial content via websites on top of the existing print and broadcast infrastructures. Online version of news suddenly became much more than just mirrored pictures of print version, equipped with additional features such as interactivities, videos, audios, hyperlinks, photographs, and graphics. Also, the borderless nature of the Internet allowed online news to reach audience across the globe, eliminating the geographical constrains. The most significant strength of online news was that limitation of space and fixed deadline for publications were dismissed. Stories broke as much, detailed, and soon as possible, which meant newspapers did not have to force themselves to prioritize certain types, and topics of news. With these characteristics of news on the Internet, there emerges another question regarding how development journalism is practiced in developing countries. Despite preceding literature that claims newspapers tend to devote higher proportion of space for development news in print and broadcast, online medium presents a challenge to mentioned conviction. With unlimited space and instant nature of delivery online, it is definitely reasonable to come to a realization that newspapers no longer need to filter out news based on priorities, limiting information and scheduling thematic coverage for the next publication or broadcast. They can literally publish all news stories – both development and non-development – moments after they obtain them. In this sense, it is not necessarily the case that newspapers remain driven to pay more attention on development news. This study, thus, explores the relationship between online journalism and development news coverage by analyzing contents on two Cambodia’s online newspapers: The Phnom Penh Post and The Cambodia Daily. Before learning about the two studied newspapers, it is of course important to have a brief introduction to Cambodia’s media landscape in general. LICADHO shows that Cambodia has been surprisingly considered as one of the freest in regard to freedom of speech in Southeast Asia. Although Cambodian constitution fully guarantees freedom of speech, there have been cases of murders, death threats and imprisonment of journalists. Press freedom on both traditional and new media in Cambodia – including print newspaper, radio, television, and the Internet – is seen with a mixture of positivity and negativity. While television is completely controlled by the government, radio and newspapers still offer quite significant hopes for real news in traditional media. There are foreign-run channels like Voice of America (VOA), Radio Free Asia (RFA), Radio France Internationale (RFI), Phnom Penh Post and Cambodia Daily that report independently in the country, and they are the primary sources that people always turn to for reliable quality news. On the Internet, freedom of speech appears very open and immune to the government as international platforms – Facebook, Twitter, YouTube, news websites and other Web 2.0 platforms – do not cooperate with the regime and have sophisticated technologies beyond Cambodian government’s technological capabilities to interfere. Online anti-government activists tend to appear anonymous due to fear of endangering their lives. The two online newspapers – The Phnom Penh Post and The Cambodia Daily – selected for this study are considered as independent from government interference although journalists may have a certain level of fears when reporting on controversial issues sensitive to the government. The Phnom Penh Post first published in 1992 in English and Khmer (Cambodian language) and was officially launched in 2009. Its audience consists of thousands of foreigners and Cambodians living in Cambodia, and subscribers in 35 countries around the globe. According to Pan, The Post publishes unbiased reporting with the goal to run a successful business that benefits society, promoting “principle of unity, raising human rights awareness, and empower people by providing educational content which are useful for people’s daily life”. In providing unbiased news of Cambodia and the rest of the world to readers in both English and Khmer, the newspaper hopes to contribute to the country’s reconstruction and rehabilitation. We aim to create an informed public that will be best able to select, through elections, the people most qualified to realize the goals of the Cambodian people. The purpose of this research is to investigate the coverage of development news of independent online newspapers in developing countries, using Cambodia as case study. Two online newspapers — The Phnom Penh Post and The Cambodia Daily — are selected for a content analysis process. The following questions are the guideline for the expected analysis. Do the two newspapers publish more development news than other types of news? How often do the two papers quote government officials or prominent political leaders when covering development news? What aspects of development are given more emphasis in the development news coverage of the two papers? The importance of this study is that it will help create awareness as to the extent to which the press gives for issues related to development. It can also benefit researchers who wish to study the Cambodian private media in terms of the coverage of development issues. It can also help understand the relationships among media ownerships and evaluate their strategies in covering development related issues, especially via online medium. Content analysis, “a research technique for the objective, systematic, and quantitative description of the manifest content of communication”, is utilized in this research study. This research study covers the year 2013. To select the sample, the whole year is divided into 52 weeks. Then, 2 weeks are randomly selected using a composite sampling. This means there are two of each day in a week from Monday to Sunday. Thus, all news stories published on each newspaper on the selected 14 days are coded and analyzed. The unit of analysis is a news story while types of story (development or non-development), length of the story (number of words used), appearance and position of government and influential political figures, and aspects of development are the major variables. news relating to the primary, secondary, and tertiary needs of a developing country. Primary needs are food, clothing, and shelter. Secondary needs are development of agriculture, industry and all economic activity which lead to the fulfillment of the primary needs, plus development of education, literacy, health environment, medical research, family planning, employment, labor welfare, social reforms, national integration and rural and urban development. Tertiary needs are development of mass media, transport, tourism, telecommunication, arts and cultural activities. To acquire the sample, two composite weeks of 2013 were randomly selected and identified, and then the database search feature on both websites – phnompenhpost.com and cambodiadaily.com – was used to find news articles on specific dates. 317 articles were found and extracted for analysis, 217 of which from The Phnom Penh Post while 100 from The Cambodia Daily. The number very well reflects the difference between the two newspapers. On one hand, The Phnom Penh Post is a for-profit newspaper that reaches out to so many subjects in the nation. Its main categories of news stories include national events, business, lifestyles, entertainment, sport, real estate and multimedia. On the other hand, The Cambodia Daily was founded as a non-profit news organization aiming to help Cambodian journalists. The coverage is narrower with the main categories of news stories as only national events, and business. The first research question asks: Do the two newspapers publish more development news than other types of news? To answer this question, two variables – types of news and length of development news – were looked at, and the results are presented in Table 1 and ­Table 2. Among the 317 sampled news articles from both newspapers, 183 (58 percent) of them are categorized as development news while 134 (42 percent) as non-development news. This finding confirms previous studies that development news is covered more than other types of news in developing countries. However, the number also indicates that the ratio of difference in development and non-development news coverage is not very significantly high at 58 percent to 42 percent. This small difference is potentially caused by the nature of online journalism. As both online newspapers have unlimited publishing spaces and flexible publishing times on their websites, they are free to publish all kinds of news stories they acquire without having to prioritize development or certain types of news. Even so, a further study should still be employed to scientifically prove this conclusion that online journalism causes newspapers in developing countries to publish less development news than they normally would in print and broadcast. Another variable on the length of development news articles suggests that the majority – as much as 50 percent of 183 articles – of them have between 300 and 500 words, which are, in this study, considered as moderate in length. Articles with 300 words or less amount to 27 percent while those with 500 words or more cover 23 percent. Based on these data, both newspapers have done a good job in covering development news. 77 percent of all development news stories have at least 300 words in length, which means the content of news is long enough for readers to make sense and have an in-depth understanding of all development issues covered. More importantly, with the fact that 23 percent (almost 1 in 5) of development news stories are those at longform level (500 words or more), The Phnom Penh Post and The Cambodia Daily do pay careful attention in covering development issues in Cambodia because longform journalism is a powerful style of writing to educate the public and influence policies. The second research question asks: How often do the two papers quote government officials or prominent political leaders when covering development news? From the data, government officials or political leaders appeared very little in development news published by The Phnom Penh Post and The Cambodia Daily as the number is only 17 percent of all 183 development news articles. Instead, 40 percent of the articles saw appearance of people who are neither government officials nor political leaders. As seen in Table 3, private sectors are predominantly quoted in development news stories. A couple of implications can be drawn based on these results, although a further study is highly suggested to make the implications more scientifically significant. First, the data justify past literature that privately-owned, independent newspapers are not influenced by the government. Obviously, both The Phnom Penh Post and The Cambodia Daily are founded by non-Cambodian individuals, and funded independently. Cambodian government also has close to no control over the operation of both newspapers. Second, Cambodia adopts a market-based economy where privatization is highly encouraged. Due to this reality, all kinds of development issues are related to private sectors, and this is why CEOs, investors, and small business owners are seen most frequently in development news articles on both newspapers. The final research question asks: What aspects of development are given more emphasis in the development news coverage of the two papers? In Table 4, it shows that secondary needs are mainly emphasized in development news stories at 52 percent, followed by tertiary needs at 33 percent. Only 15 percent of all development news stories cover primary needs. These numbers are very reflective of what Cambodia is facing, development-wise. Secondary needs refers to all kinds of economic and social activities that feed to all primary needs such as food, clothes and shelters. As a country known as one of the world’s poorest nations, Cambodia is clearly in a transition period after decades of wars, and the high volume of secondary needs covered in the news is an apparent evident. In Table 4, all economic and social activities listed under secondary needs appeared in the coverage of development news by The Phnom Penh Post and The Cambodia Daily, and these activities are the backbones of Cambodia’s development. More noticeably, tertiary needs, which are considered as additional or even luxurious activities for people with high quality of life, appear to be quite popular in development news coverage at 33 percent. This displays a very positive image for Cambodia in how far the country has come in regard to development, implying that quite a huge number of Cambodian people have begun to experience high living standards despite the country’s status as one of the least developed nations. The goal of this study is to find out if Cambodian newspapers, The Phnom Penh Post and The Cambodia Daily, cover development news more than other types on news on their websites, and if both newspapers quote government officials or prominent political leaders when covering development news. Based on the results from content analysis, the two papers do cover more development news than non-development ones at the ratio of 58 percent to 42 percent, thus confirming the literature that development news is given more attention in developing countries. Regarding appearance of government officials or political leaders in development news articles, the findings disagree with past studies, suggesting that private sectors dominantly appears in development news. The reason is that Cambodia adopts a market-based economy where privatization is applied to almost of all development issues. Moreover, Cambodia government does not have any control over the privately owned, independent newspapers, particularly The Phnom Penh Post and The Cambodia Daily. 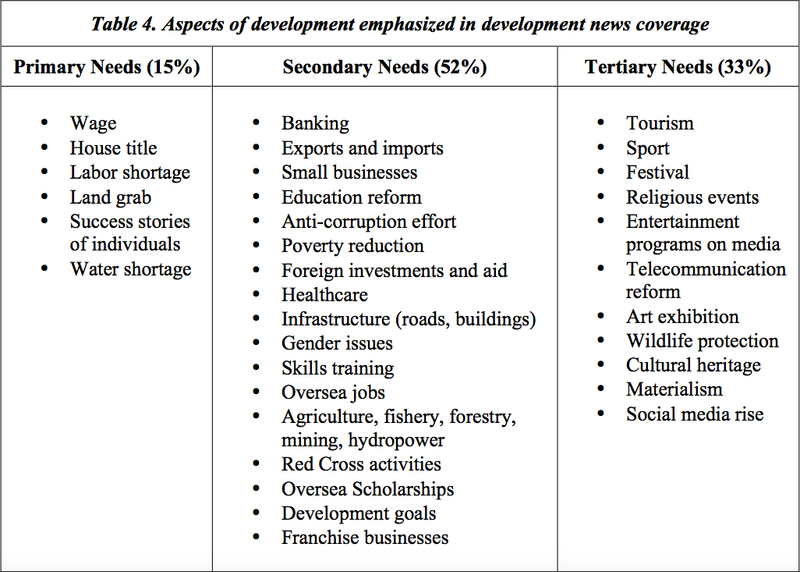 When looking at what aspects of development are given more emphasis in development news coverage, secondary needs top the chart at 50 percent, followed by tertiary needs at 33 percent. The emphasis on both secondary and tertiary needs reflects a very promising picture for development in Cambodia. The country is obviously in a transition period where the people start to enjoy gradually growing development. The study also has one limitation when it comes to confirming the notion that online journalism allows newspapers in developing countries to cover other types of news as much as development news because they have unlimited publishing spaces and flexible publishing times on their websites. The findings in this study illustrate that although development news is covered more than non-development ones, the ratio of difference is relatively small at 58 percent to 42 percent. Unfortunately, this study’s content analysis methodology fails to collect data that prove online nature of newspapers having a role in balancing out development and non-development news coverage. Future studies are suggested to employ an in-depth interview with the editors of both newspapers as an additional method in order to acquire more informing data in understanding the relationship between online journalism and development news coverage.